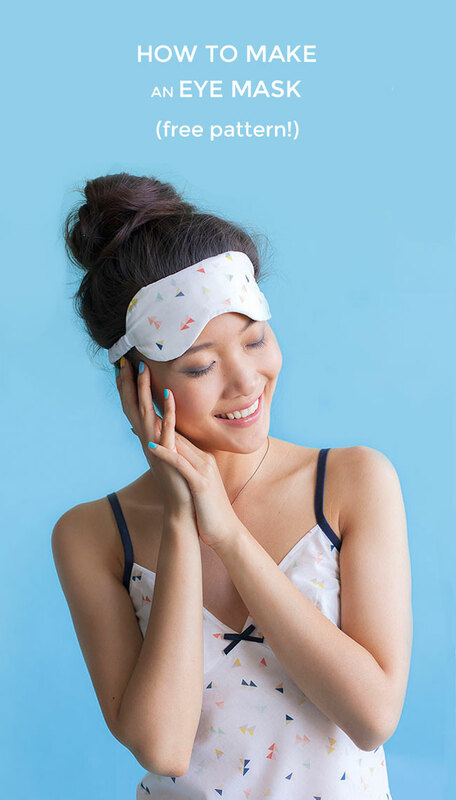 There’s something so indulgent about slipping on an eye mask to help you get enough beauty sleep during light Summer nights… particularly when it matches your frillies! 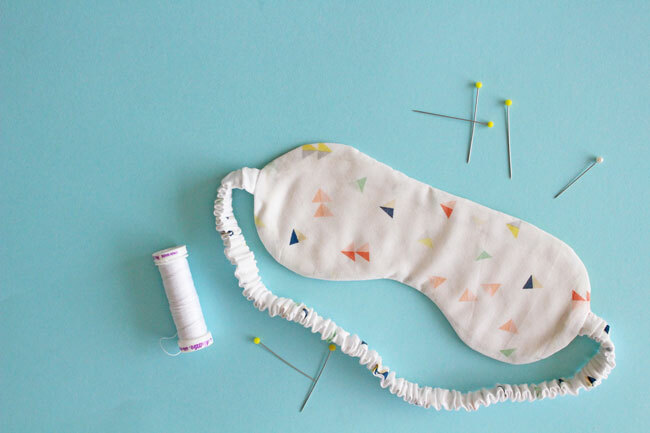 We couldn’t resist making an eye mask to go with the Fifi camisole and shorts set – and we’re sharing the pattern with you for free so you can make one too. Yay! This is a lovely speedy make, and a perfect project for using up leftover fabric. Ooh and it makes a great gift! Open the pattern file in Adobe Reader (you can download it for free). Print the pattern on either A4 or Letter size paper, selecting “actual size” or “set scaling to 100%” or “turn off scaling” in your print settings. You can double check the pattern has printed at full scale by measuring the test square - it should be exactly 40mm x 40mm. 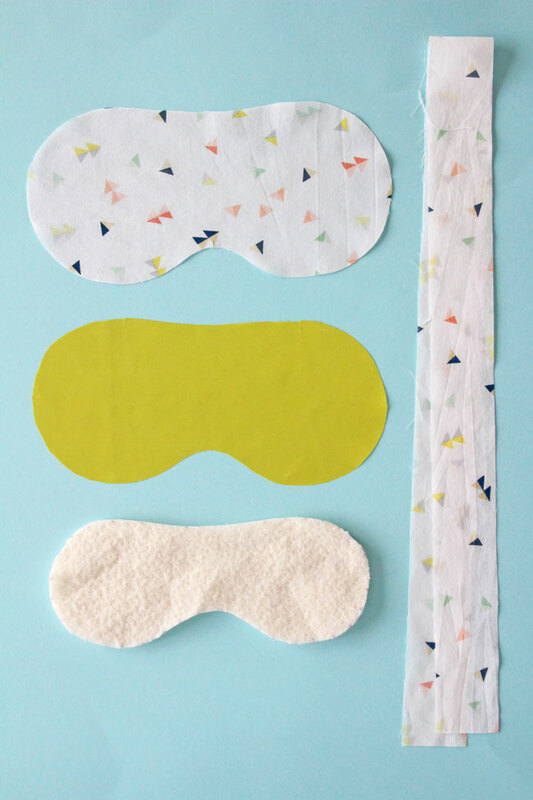 Cut 1 eye mask pattern piece in your main fabric, snipping the notches. Cut 1 eye mask pattern piece in facing fabric, snipping the notches, then trim it down by 2-3mm (1/8in) all the way around – this will help the seam roll to the back so it’s not visible when you wear the mask. Cut 1 eye mask pattern piece in wadding, then trim it down by 15mm (5/8in) so it will fit inside the other pieces comfortably. 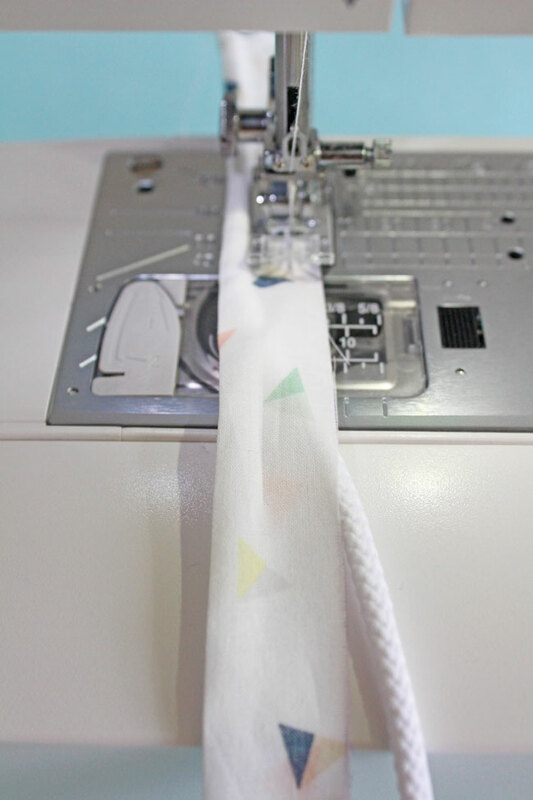 Cut a rectangular strip in your main fabric for the elastic strap, 90cm (35½in) x 4cm (1 5/8in). Stitch together the long raw edges of the strip using a 7mm (2/8in) seam allowance, enclosing the string next to the fabric fold. It helps to pull the string taught as you go, so you don’t sew over it. You should now have a tube. Take hold of the loose end of the string and pull it out of the tube, turning the tube right sides out over it as you go. This can take a bit of time so go slowly! It can help to use then end of a pen or pin to push the fabric inside itself. Once it has turned all the way out, trim off the end with the string attached and give it a good press to neaten it up. 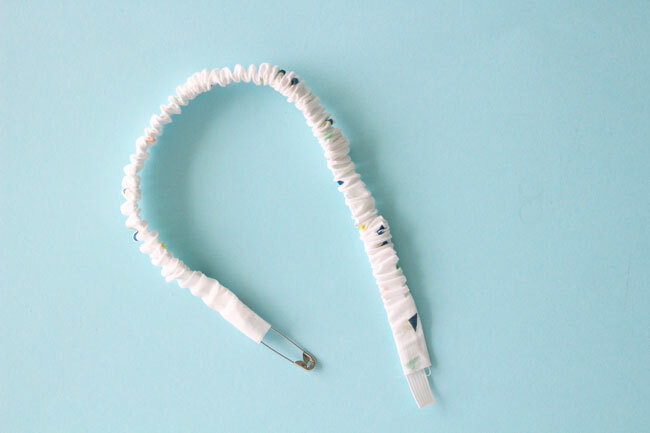 Attach a safety pin to one end of the elastic, and pin the other end to one end of the tube temporarily. 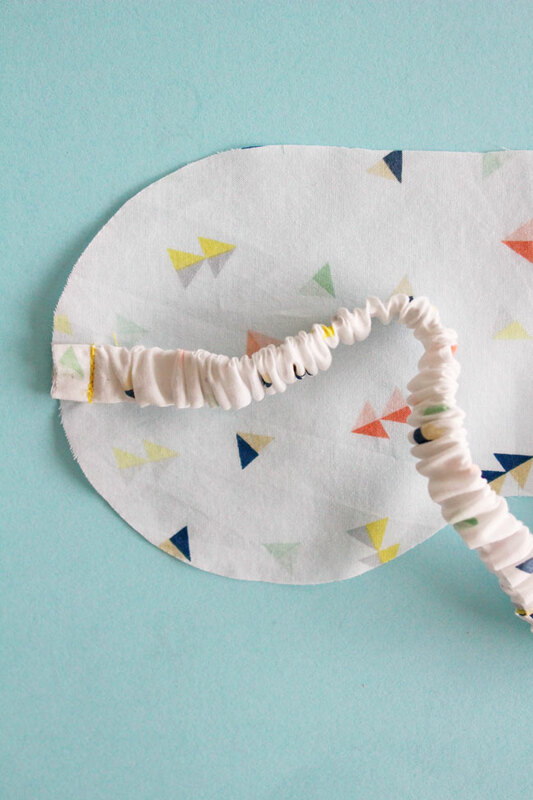 Insert the safety pin into this end of the tube and feed it through, distributing the fabric evenly as it starts to gather up. When the safety pin emerges at the other end, pin it to this end of the tube. 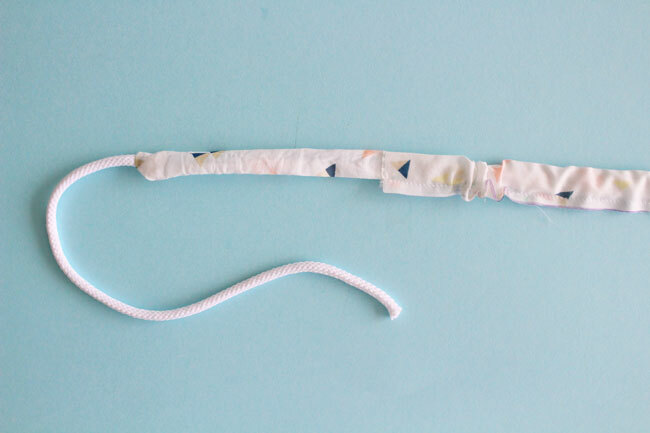 With each end of elastic lined up with the opening of each end of the tube, stitch across each tube opening using a 10mm (3/8in) seam allowance to secure the elastic in place. Tack (baste) one end of the elastic tube to each side notch on the eye mask piece, right sides together, using a 10mm (3/8in) seam allowance. Make sure the tube isn’t twisted. 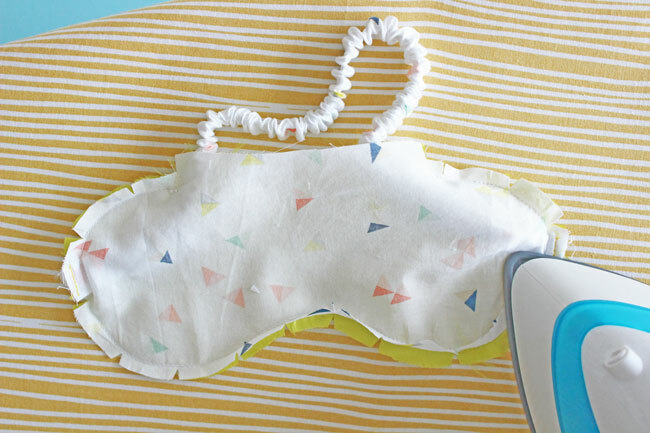 Lay the facing piece on top of the eye mask piece, right sides together. Pin them together around the outside edge, matching the notches - since you trimmed the facing, you'll need to stretch it ever so slightly. The elastic tube will be sandwiched in the middle – take care not to catch it in the pins. 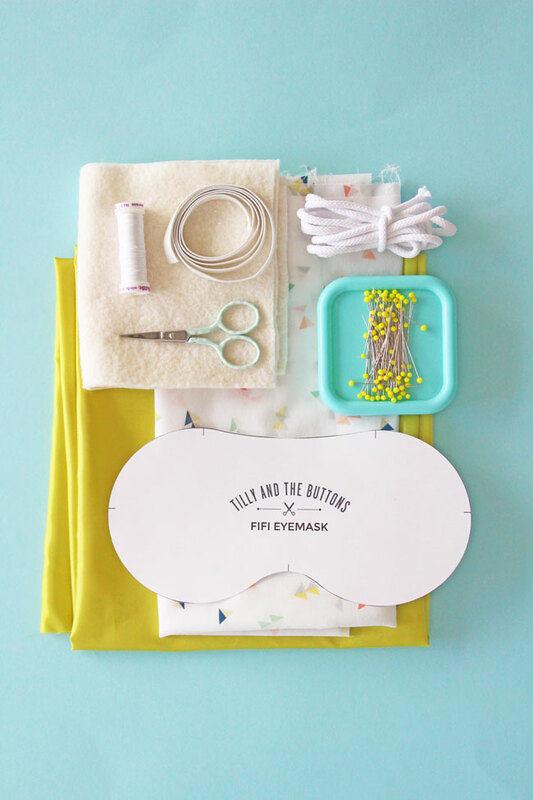 We need to leave an opening between the two notches on the top edge of the eye mask – you can mark each side of the opening with two pins to remind you to stop sewing here. 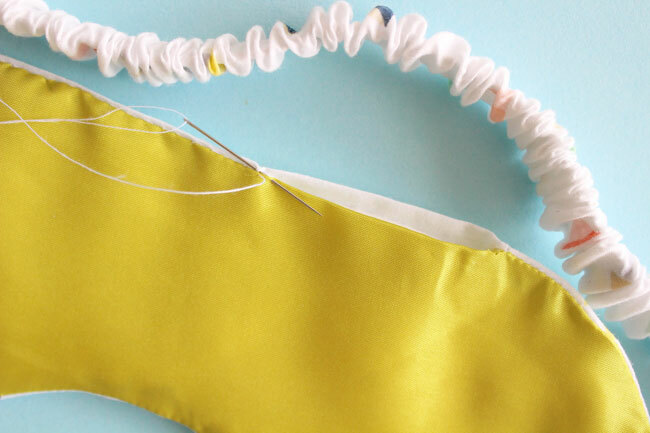 Stitch around the outside of the eye mask, using a 15mm (5/8in) seam allowance - remember to leave an opening between the two pairs of pins. Trim the seam allowances and notch small triangles around the seam allowance every 2.5cm (1in) or so, being careful not to snip through the stitching. 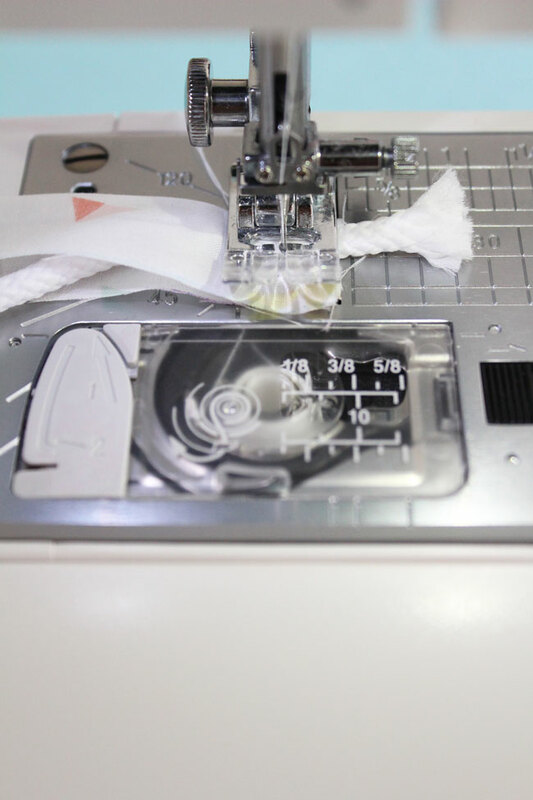 Press the seam allowances open (test the iron setting on your fabric first). Turn the eye mask right side out through the opening. Press again, rolling the seam slightly under towards the facing so it’s not visible from the right side of the mask. 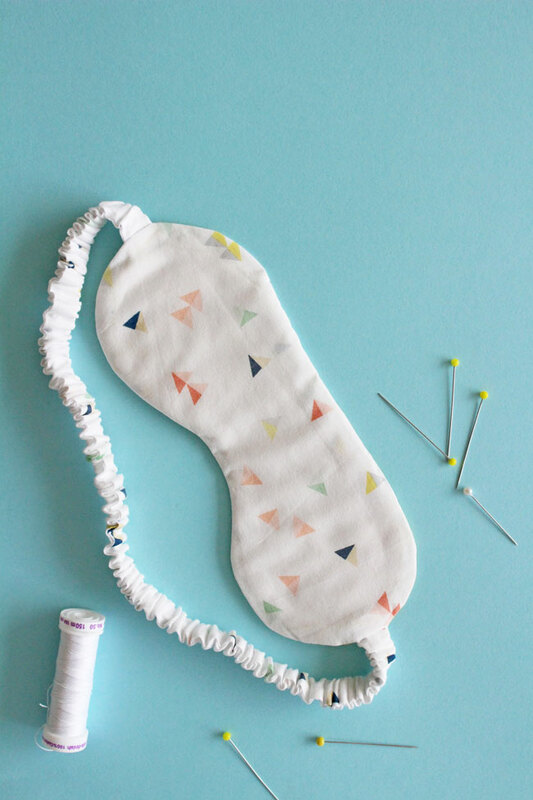 Slip the wadding into the eye mask through the opening and smooth it out. Press the seam allowances on the opening to the inside of the mask and pin the opening closed. 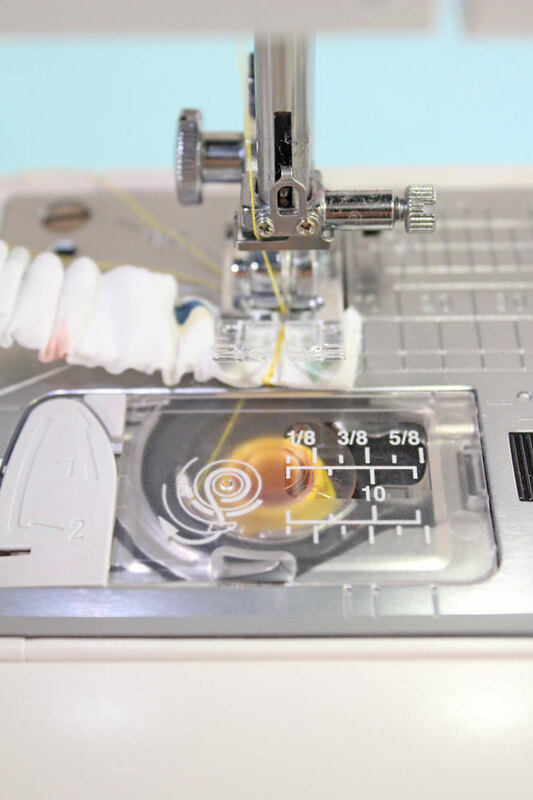 To close up the opening, you can slipstitch it by hand, or take a short cut and edgestitch it (topstitch close to the edge) on your machine (we won’t tell!). 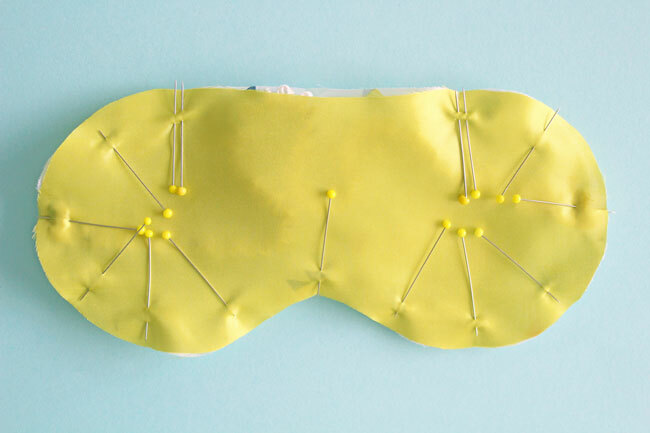 Admire your completed eye mask, and have a very stylish night’s sleep! 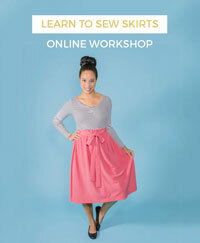 Maybe you could make one for our Summer Sewing Instaspam Party? 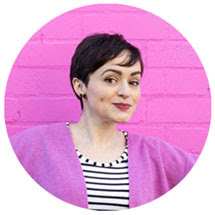 Post a photo of your Fifi boudoir set or Bettine dress to Instagram or Twitter on Sunday 9 August 2015 using the hashtags #sewing and either #SewingFifi or #SewingBettine, and search the hashtags to find others at the party. See you there!